Nothing says summer quite like biting into fresh plump kernels of sweet corn right off the cob. And hands-down that’s my favorite way to eat it – for its simplicity, ease and earthy sweetness. Freshly picked sweet corn, grilled or boiled, lathered with butter, sprinkled with salt and pepper. It doesn’t get much better than this. Plus, it provides endless entertainment. Have you ever noticed the method one uses to eat corn off the cob? To me, it says a lot about personality. There seem to be four predominant eating styles: the typewriter, in which one chomps left to right in perfectly straight and even rows, indicative of a very orderly and organized human being with an analytical mind; the spiral, in which one eats rings around the cob from one end to the other, most likely revealing a fluid, creative, right-brained individual who tends to go with the flow; the hunt-and-peck, in which one eats haphazardly, without rhyme or reason, perhaps indicating someone is scatter-brained, distracted and quite possibly brilliant; and, lastly, the knife, in which one cuts the kernels off of the cob before indulging, refusing to bite in, maybe in an attempt to disguise their strategy and remain mysterious, or simply a little obsessive about keeping their teeth clean. Fresh sweet corn, sliced off the cob, offers up many uses in the kitchen. It can be added to many dishes we already make, giving them a delicious seasonal twist. 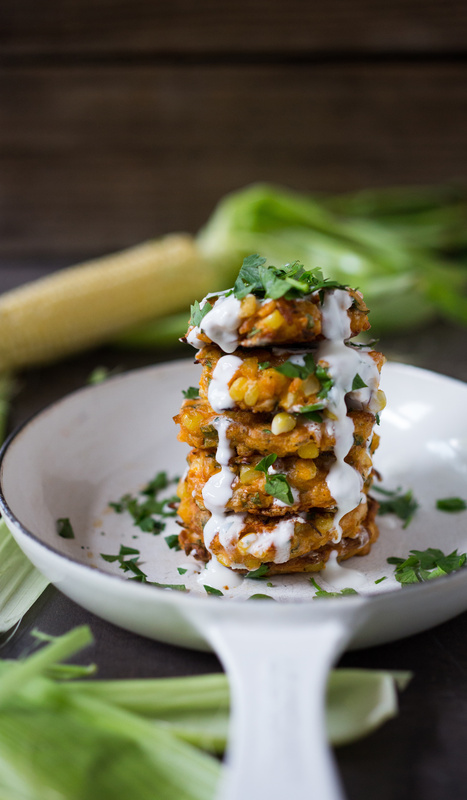 Think fresh corn risotto with butter and parmesan, ravioli with a creamy corn sauce, spicy jalapeno corn salsa, corn- and chili-filled enchiladas or quesadillas, or grilled corn and zucchini pizza. When cooking with fresh corn, the most important thing is to choose the best corn possible. The best corn possible is not necessarily white or yellow or even a certain variety. The best corn you can possibly get is the corn that grows closest to your kitchen. This is because as soon as corn as picked it begins to convert its sugar into starch and gradually loses its sweet flavor. When it comes to flavor, time is corn’s greatest enemy. If you have a backyard garden with corn growing in it, you are in luck: you probably already have the best corn possible. But if you are like me and can’t grow corn in your shady backyard, the next best thing is to seek out the nearest grower. We are fortunate around Spokane to have many farms that grow corn and often bring their freshly harvested crops to farmers markets within hours of picking them. As the crow flies, the nearest grower of corn to my home kitchen is Urban Eden Farm, located in Vinegar Flats, a five-minute drive from downtown Spokane. Farm manager Ingrid Hannan grows a non-GMO variety of corn called Sugar Buns. The tassel, or male part of the plant, releases millions of grains of pollen, and only some of these are caught by the silk, the female part. “If you only plant one row, the wind may carry most of the pollen away,” said Hannan, a self-declared spiral eater who often eats corn raw as an afternoon snack, giving her the extra burst of energy she needs to finish out her long day of farming. There’s one silk for each kernel of corn on a cob. There are 400 to 600 kernels on an ear of corn, and an ear always has an even number of rows, averaging 16. Corn originates from Central America, where it was first farmed more than 10,000 years ago. Gradually, it was bred to have more and more corn – bigger ears with more kernels and fewer leaves – making it easier to eat. There are many types, and not all are sweet or edible. Farmers often grow field corn, which is considered a grain and mainly used for flours, corn meal and animal feed. It’s not really edible in its fresh state the way sweet corn is. Corn comes in many different colors, including red, pink, black, purple and blue. It’s a phytonutrient-rich food that provides us with well-documented antioxidant benefits. It’s also a good source of magnesium, vitamins C and A, potassium and fiber. When choosing corn, look for husks that are green and moist. Feel the kernels through the husk to check for uniformity and plumpness, but if you are not sure, pull back the husks and examine before buying, especially at a grocery store. This will save you from ending up with corn that is mildewy or shriveled, clearly past its prime. If the husk looks as if it has already been pulled back, chances are, someone already checked it and ruled it out. Set it aside and dig a little deeper in the pile. If purchasing at a farmers market, you won’t have to worry about this, the corn was most likely picked within 12 hours. During a very dry growing season, like ours, the very tips of the corn may look dry and undeveloped. This is OK and has no effect on the flavor of the corn. When slicing kernels off the cob, lay the cob on the cutting board, on its side, cutting downward, rather than holding it vertical, by the tip. This will prevent kernels from flying into every nook and cranny of your kitchen. For this salad, corn is cut of the cob and tossed with radishes, red onion, Italian parsley and lime juice. As it marinates, the salad gets more flavorful. Serve it with grilled meats as a light and healthy side. Shuck and clean corn, wiping off stray threads with a kitchen towel. Cut kernels off with a large sharp knife and place into a large bowl. Thinly slice radishes and place into the bowl. Very thinly slice onions and place in the bowl. Add chopped parsley. Add the lime juice, olive oil, salt, pepper and coriander, and toss well. Refrigerate for up to 3 hours. This recipe is a big hit around my house. The fritters are full of flavor, easy to make and great as an appetizer or light meal served alongside a hearty salad. Juicy plump kernels give the fritters the perfect texture. For this reason, I never make them with canned or frozen corn. It just wouldn’t do them justice. This is a recipe to use when fresh corn is in season and readily available. Make the fritters: In a large bowl, combine first 6 ingredients, and mix well. In a smaller bowl whisk milk, eggs, zest and lime juice. Whisk wet into dry to make a batter. (It is OK if there are tiny clumps, but work the big ones out with the whisk.) Fold in the remainder of the ingredients through jalapeño. Preheat oven to 350 degrees. Heat a large heavy-bottomed skillet (I use cast iron) with a generous amount of vegetable or canola oil, mixed with a little butter (optional) on medium-high heat. Wait until oil is hot, and turn heat down to medium. Place rounded spoonfuls of fritter batter (2-inch round fritters) carefully into skillet and cook for about 3 minutes on each side until crispy and golden brown. Add more oil if necessary. Make in batches, moving fritters to a sheet pan and transferring to a warm, 350-degree oven for 15 minutes, until they puff slightly. Make the cilantro cream: In a food processor, pulse cilantro cream ingredients until blended. Serve on the side. Serve: Garnish with cilantro, lime and your favorite hot sauce. Another way to incorporate fresh sweet corn into your repertoire is to serve it for breakfast. Add plump kernels to quiche, frittatas or omelets with soft cheese and tender herbs. In this succotash, fresh corn is sautéed with zucchini, sweet peppers and green beans until tender, then seasoned with spices. Wobbly poached eggs are nestled in the corn succotash and a flavorful herb oil is spooned over the eggs. If you prefer your eggs cooked all the way through, crack the eggs right over the corn succotash and place the skillet in a hot oven until cooked to your liking. Make the succotash: In a large skillet, heat oil over medium-high heat. Add onion. Saute until tender, about 3 to 4 minutes. Add garlic. Turn down heat to medium, and cook until garlic is fragrant, about 2 minutes. Add zucchini and green beans and cook about 5 minutes, then turn heat to medium low. Add peppers and corn. Cook on medium low for 10 to15 minutes until everything is tender. Season with smoked paprika, salt, cumin and pepper, and leave on very low heat. Make the herb oil: Place all ingredients in a bowl and stir to combine. To serve: Place poached eggs over top and sprinkle with salt and pepper and a teaspoonful of the flavorful herb oil. Finish with chili flakes and scatter cherry tomatoes over and around. Serve immediately. Note: For the herb oil, I prefer using mostly Italian parsley and then adding 1 or 2 other herbs as an accent. It takes quite a lot of herbs to make ½ cup of chopped herbs. They really condense down when chopped.